This monument of nature, with a geological history that dates back millions of years, and religious customs that have endured across 10 centuries underscore the majestic beauty of the landscape and bring spiritual revival. This panoramic shot of the “Stone Forest” captures the magnificence of this place in its entirety. 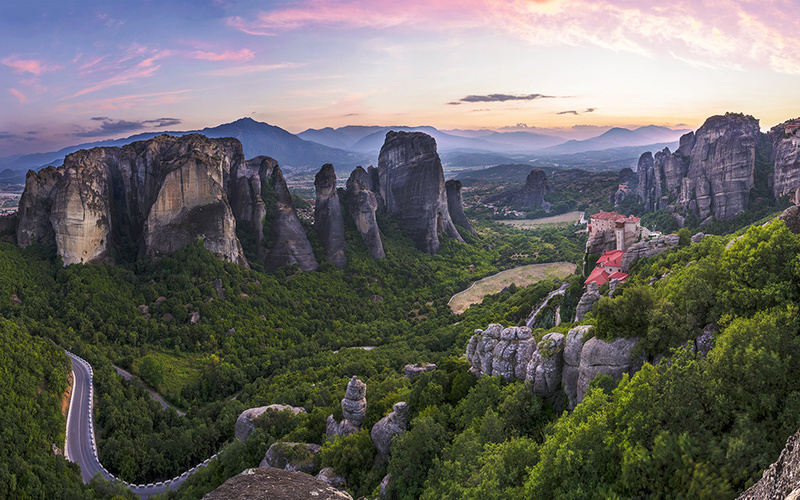 Meteora, featuring towering sandstone rocks and age-old monasteries and cloisters, is listed as a UNESCO World Heritage site and ranks as a leading tourist attraction, not only for the region of Thessaly but for Greece as a whole. 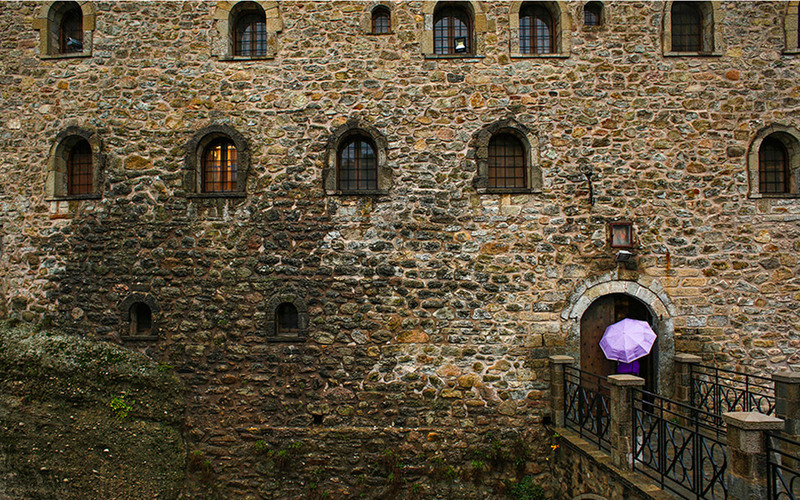 Thousands of tourists visit to admire the unique landscape and get a glimpse into the centuries-old traditions of monastic living. 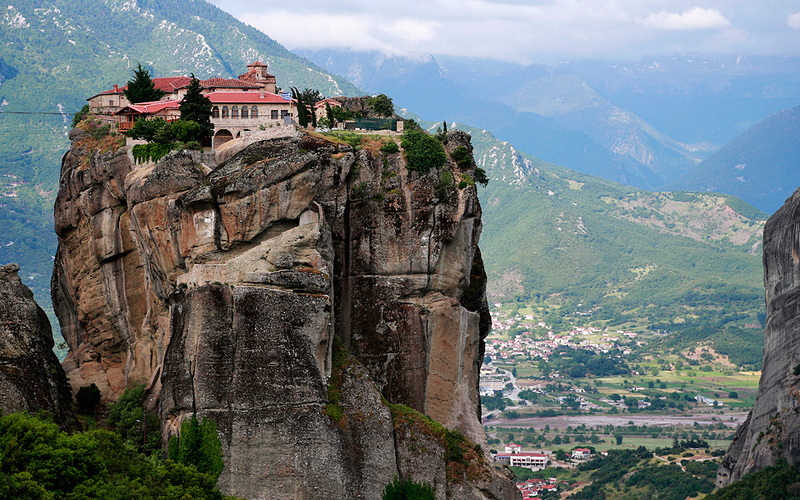 The first monks, primarily solitary individuals, are believed to have arrived at Meteora in the 11th century. Over time, organized communities were established and thrived here for hundreds of years. The small road leading to the Holy Monastery of Varlaam, photographed from above. This monastery, named after the first monk believed to have lived on the rock during the 14th century, is one of six Meteora monasteries open to the public and undoubtedly one of the most noted. It is estimated to date from the 16th century, when Nektarios and Theofanis Apsarades, two brothers from an old Byzantine family in Epirus, northwestern Greece, settled here, renovating older structures and constructing new ones. Most of the 24 monasteries that were established here over the years are now abandoned, and just six remain open to the public. These are the monasteries of Varlaam; the Great Meteoron; Aghios Stefanos; Rousanou, renowned for a marvellous depiction of the Second Coming; the Holy Trinity, featuring an old church dating back to 1475; and Aghios Nikolaos Anapausas, adorned with very significant post-Byzantine murals. Travelers to Meteora should also make it a point to visit the town of Kalambaka, located directly below the rock complex, where there are two fascinating museums, the Greek Education Museum and the two-in-one Natural History Museum of Meteora and Mushroom Museum. 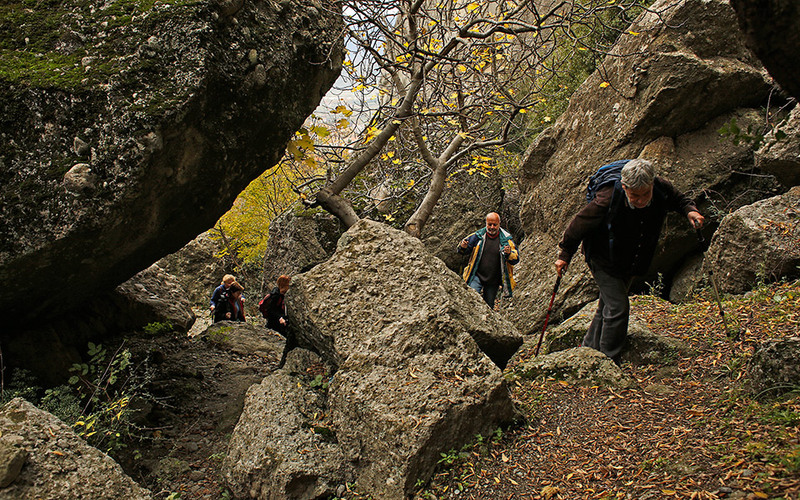 Trekking from the square in the village of Kastraki towards Fylakes Monahon, a route that ends at the parking area of the Holy Monastery of Aghios Nikolaos Anapausas parking area. Regarded as one of the loveliest routes, this trail through the forest takes about an hour to cover and has a “medium” degree of difficulty. 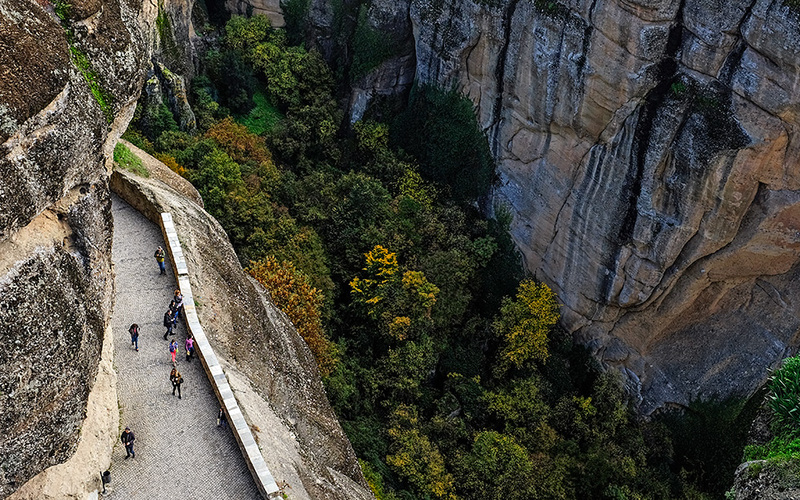 The climb through the “Stone Forest” of Meteora is an unforgettable experience, offering spectacular views of the towering Meteora rocks, the monasteries and the abandoned cloisters. This path is one of many in the area; there are also trails appropriate for trekkers without experience. However, it is often better to be accompanied by a guide, as not all the routes are marked. The Holy Monastery of Aghios Stefanos, the southernmost of the six Meteora monasteries open to the public, is located above the town of Kalambaka. In contrast to the other monasteries, it is easily accessible, as its entrance is linked to the road by a small stone bridge. The rock on which the monastery stands is believed to have been first inhabited towards the end of the 12th century, while the monastery itself was constructed during the 15th and 16th centuries. An order of nuns well known for their social welfare activities settled this monastery in 1961. 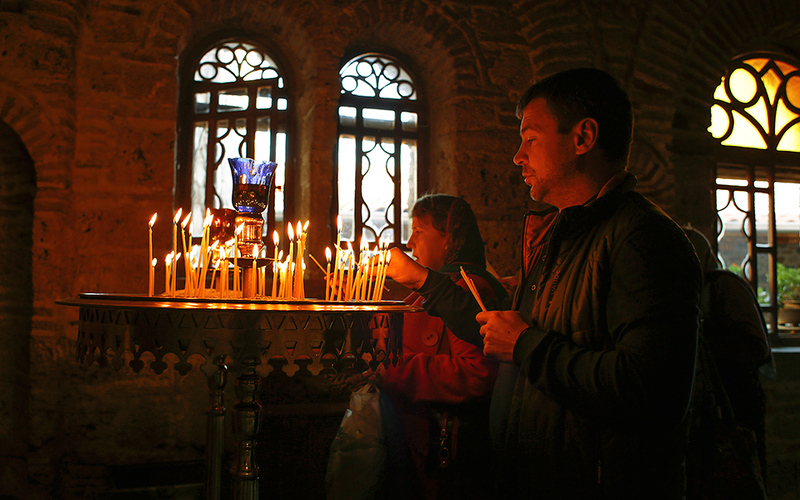 There is an atmosphere of devotion at the Holy Monastery of Great Meteoron, the most renowned of all the Meteora monasteries, situated at an altitude of 613 meters. It was founded by St. Athanasios the Meteorite, a scholarly monk from Mt Athos, who began building the monastery in the mid-14th century. It is thought that he was succeeded by Saint Iosaph, maternally related to the Palaiologos Byzantine imperial family, who abandoned worldly power to become a monk here somewhere around the age of 22. In addition to being an impressive structure in its own right, the monastery maintains a number of very interesting exhibition spaces, including a manuscript museum with display items such as a medieval parchment copy of the Four Gospels and a very old publication containing the works of Plato.